We're in the midst of the Boston-Vancouver series and even though the finals are much later in the year than they used to be, I often harken back to my younger days, when the Leafs were usually very good and there were a grand total of six teams in the NHL. I’m sure I’m not alone among Leaf fans of days gone by when I say that my favorite era in many ways was the early ‘60s. With the Leafs winning three Cups in a row, it was obviously a good time to be a Leaf fan, though pickings have been slim at times since. As I’ve mentioned in earlier posts from time to time, I really enjoy watching “classic” games from those days on ESPN, Leafs TV or the NHL Network. The older the better. I can’t get enough of those old-time battles. Some games I couldn’t see as a child because we lived across the border from Detroit and many Leaf playoff games were blacked out. I could only listen on the radio, and that was a great way to feel the excitement of old-time playoff hockey, too. So to see the games now as an adult brings a real (and renewed) appreciation for the players back then, including those on opposing teams. I’m thinking particularly right now about the Red Wings. In the modern era, the Wings have been perhaps the ultimate “model” franchise in the NHL. Great ownership, outstanding management, top-end coaches and players who play for the team have all added up to tremendous success, especially notable in a 30-team league where it is so hard to win. Now back when I was a kid, the Wings were even more of a powerhouse, granted in a much smaller-sized league. They were the best team in hockey throughout the first half of the 1950s, winning four Stanley Cups and, amazingly, finishing first overall in the regular season standings seven years in a row. Can you imagine something like that in this day and age? At the moment, I’m thinking about the 1962-’63 series that the Leafs won in 5 games to earn their second Cup in a row. I was just turning 10 at the time, so while I have some very vivid memories, I was pretty young to appreciate the opposition. Back then, I was primarily pre-occupied with the Leafs winning- not how they did it or who they did it against, necessarily. But looking back and watching some of those classic games with the eyes of an adult (and someone with more experience as a hockey-watcher) I was impressed with the way the underdog Red Wings competed against Toronto. To provide some context, that 1962-’63 Leaf team may have been the very best Maple Leaf of my lifetime. Why? 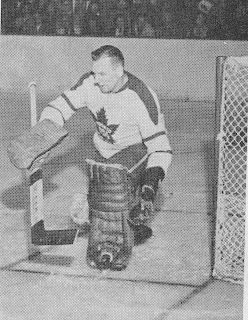 Well, they had Johnny Bower (pictured at right in the early 1960s with the Leafs; click on his name to read my earlier story) in his prime in goal and he was injury-free that spring. Bower had great reflexes but maybe most significantly the guy was flat-out a competitor. For such a "nice" guy (and he was and still is) he absolutely hated to lose. On defense, the “Fab four” was in charge—Horton and Stanley, Baun and Brewer. On top of that, throw in rookie-of-the-year Kent Douglas, who filled in as a “5th guy” (teams usually relied on only four d-men in those days) and a power-play specialist. Up the middle, Kelly, Pulford, Keon and Billy Harris were a great quartet. Combined they brought experience, speed and passing skills galore. I won’t go through the rest of the line-up, but they were deep everywhere, with guys like Dickie Duff, George Armstrong, Frank Mahovlich and Bobby Nevin. They were the best team in hockey that year, having finished first in the regular-season standings. On the other hand, the Red Wings were, in some pre-season predictions, not expected to have a big year. So to make the finals was a pretty significant achievement. When you talked about the Wings in those days, you expected the big names like Gordie Howe and Alex Delvecchio to perform—and they did. But I loved seeing the so-called “lesser-lights” in action, too, when I had the opportunity to see some of those games a while back. Vic Stasiak, who had been a big part of the famous “Uke Line” with Johnny Bucyk and Bronco Horvath in Boston in the late 1950s was an important part of the Wings, too. 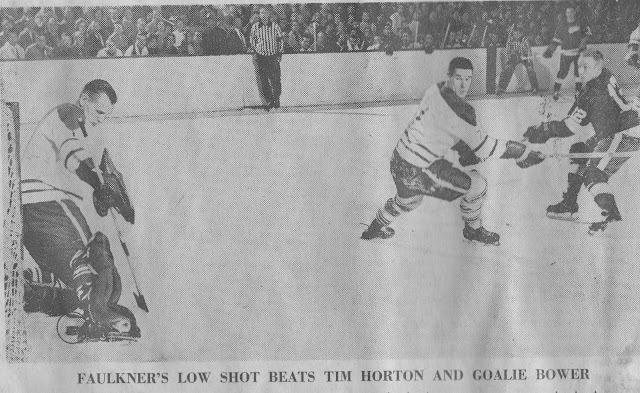 He also scored a big goal in Game 3 of that ’63 Toronto series. Little Val Fonteyne didn’t get a lot of ice time, but he was a valuable penalty-killer with the Wings who went on to play more regularly in the early post-1967 expansion years with Pittsburgh. Pete Goegan is another Red Wing that I remember as a kid. He was a part of the Wings defense corps in the early 60s. The Big Three of Doug Barkley, Bill Gadsby and Marcel Pronovost played a ton, but guys like Goegan or Junior Langlois (part of some Hab Cup teams, like Andre Pronovost) and the talented but combustible Howie Young were off and on part of the defense pairing equation in that era, too. I’ve posted on the tenacious Larry Jeffrey before, and he was a Wing I really admired. 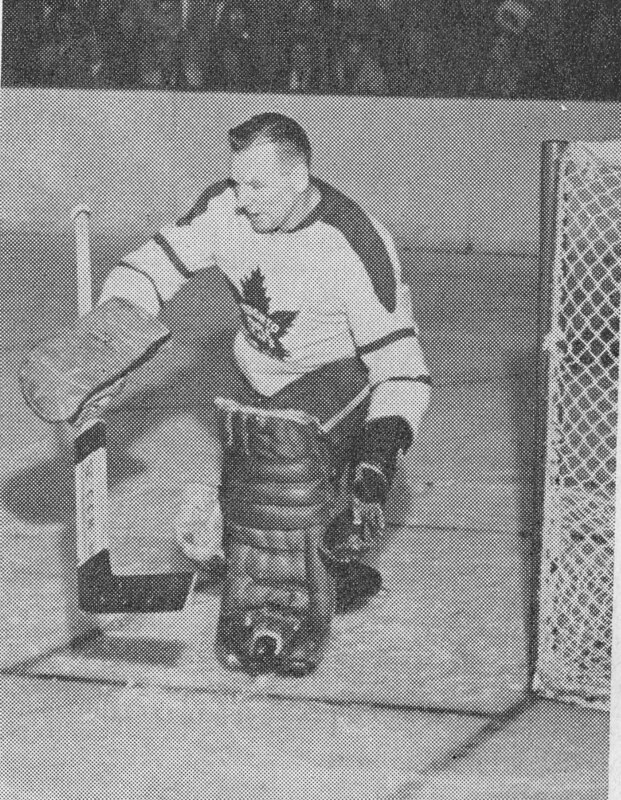 He later played a solid role in helping the Leafs win the Cup in ’67, until he was hurt in Game 6 against the Hawks in the semi-finals. All this is to say, while I enjoyed the Leafs winning those Cups in the early '60s, hockey is a game of breaks and inches. It’s important, even years after the fact, to acknowledge the effort and skills of the vanquished opposition. It could easily have gone Detroit’s way in 1963 and 1964 (especially so in '64), and in addition to their “stars”, their role-players, checkers and grinders—some of whom I’ve mentioned above- all made significant contributions and helped make for some very exciting playoff series. I recall those series well. Detroit played very well but just couldn't get over the top. Toronto had a little more scoring balance and were just a hair tougher than the Wings. But not by much.